If you follow the activities of Rep. Trey Gowdy (R-S.C.), you could be forgiven for having no idea that he oversees the chief investigative arm of the legislative branch. 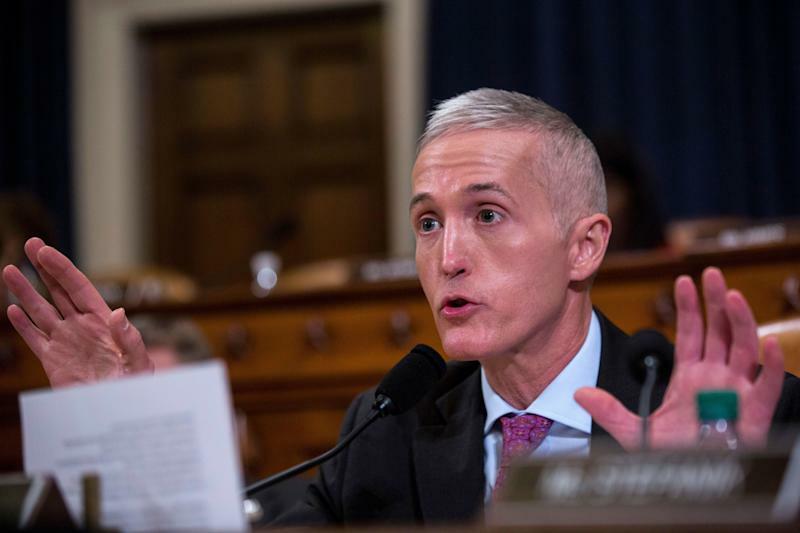 The House Committee on Oversight and Government Reform, which Gowdy chairs, is designed to be a watchdog for the American people. It has unique and distinct authority to conduct oversight of the executive branch. The chairman has the unilateral authority to issue a subpoena to compel testimony at a congressional hearing and the production of documents, records and emails. The chairman can compel any federal government employee to participate in an on-the-record deposition. If the chairman calls for a congressional hearing to scrutinize a member of the Cabinet, that secretary must show up. I spent more than four years working as spokesman and senior adviser for Rep. Darrell Issa (R-Calif.) when he was chairman of the oversight committee during the Obama administration. During that time, the panel held more than 350 full-committee and subcommittee hearings, sent more than 2,000 letters requesting information from government agencies, and issued more than 100 subpoenas. Due respect Mr. Gowdy, but how the hell would you know? Environmental Protection Agency Administrator Scott Pruitt hastaken 35 trips in the last yearin a flagrant display of waste, fraud, abuse and mismanagement, and you can’t be bothered to take a break from yourbook tourto hold a hearing on the matter. In the 10 months since he assumed the chairmanship, Gowdy has heldfewer than 10 full-committee hearings centered on oversight and has issued zero subpoenas. In fact, last month, Gowdy and Republicans on thepanel blocked a requestfrom ranking member Elijah Cummings (D-Md.) to consider Democrats’ request to allow a debate and vote on 13 subpoenas. Since Donald Trump became president, Gowdy and his Republican colleagues have rejected requests to consider subpoenas 32 times. Meanwhile, committee Democrats have been vigilant in their pursuit of answers on behalf of American taxpayers. This week alone, Democratic members have called onGowdy to hold a hearingabout Pruitt’s questionable activities and asked the chairman to issue a subpoena to the EPA. They asked theCommerce Department to provide documentsrelated to its controversial decision to ask about citizenship on the 2020 census. Theyrequested documents from the executive branch’s Office of Government Ethics concerning a legal defense fund establishedto help White House staff, Trump campaign officials and transition team members under investigation by special counsel Robert Mueller and Congress. Cummings asked Gowdy to subpoenathe administration for documents regarding reports that onetime Trump campaign chairman Paul Manafort promised the job of Army secretary to a banker who lent him millions of dollars. He also sent a letter toCambridge Analytica requesting information on its political activities in the United States. As ranking member, Cummings knows full well that the Trump administration will not voluntarily cooperate with him. He knows that Gowdy is too busy promoting his book to do his actual job and hold hearings. He knows that Republicans, who had no issue with the committee issuing subpoenas like drunken sailors during the Obama years, will continue to obstruct Democrats’ efforts to hold the Trump administration accountable. But Cummings also knows that a blue wave is forming that could usher him into the chairmanship in nine months. When the 116thCongress convenes in January 2019, Cummings will be prepared to unleashan oversight onslaught that could immobilize the Trump presidency. Federal agencies won’t be getting document requests asking for their voluntary cooperation ― they’ll be served subpoenas. Administration officials will be forced to take centerstage, raise their right hand, and testify under oath at public congressional oversight hearings to answer for their mismanagement and abuse of taxpayer dollars. They’ll no longer have Republican cronies like Trey Gowdy turning a blind eye to their incompetence and misconduct. Kurt Bardella is a HuffPost columnist. He is a former spokesman and senior adviser for former House Oversight and Government Reform Committee Chairman Darrell Issa (R-Calif.). Follow him on Twitter at @kurtbardella.